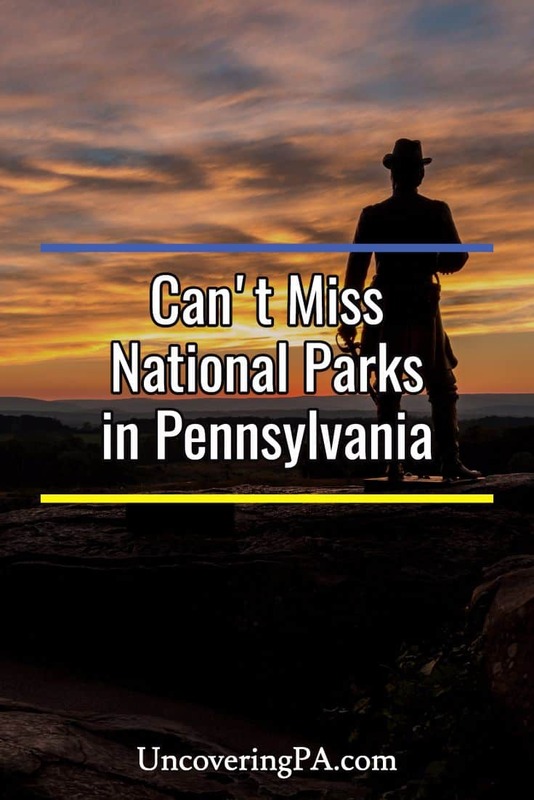 While you probably think of America’s beautiful national parks when you think of the National Park Service, you might not be aware that the park service manages nearly 30 sites, heritage regions, trails, scenic rivers, and much more within the borders of Pennsylvania (See the full list here). Some of these sites are very well known and draw millions of visitors a year. On the other hand, some only draw a few thousand visitors annually. 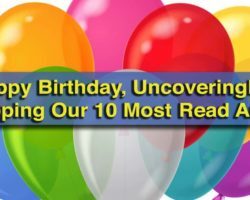 All of these sites and regions are worth visiting and offer some of the best historical narratives and nature that the country has to offer. However, having visited nearly all of these sites, there are a few that stand apart to me as being especially fascinating. 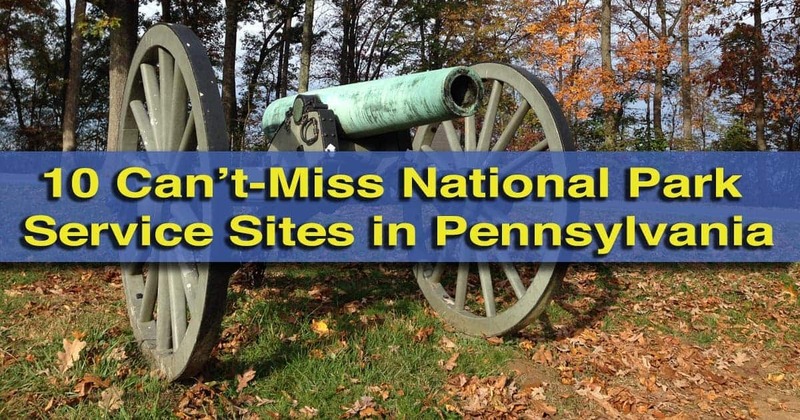 Here are my 10 personal favorite National Park Service sites in Pennsylvania. Fort Necessity National Battlefield commemorates the start of the French and Indian War. 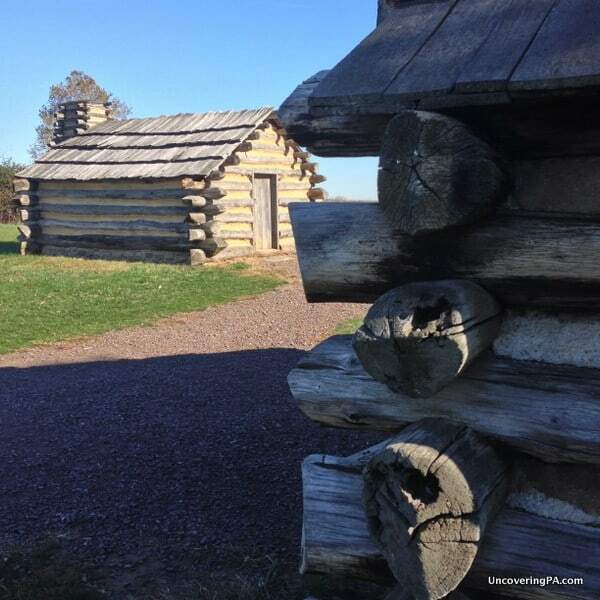 Fort Necessity National Battlefield in Pennsylvania’s southwestern corner commemorates the first battles of the French and Indian War and George Washington’s only surrender. 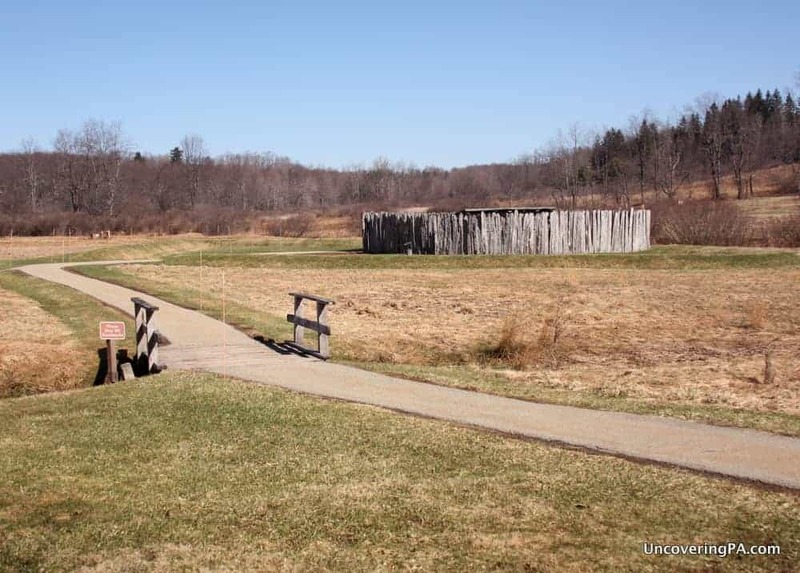 You can draw a straight line directly from the events at Fort Necessity to the Declaration of Independence and American freedom, making this one of the most important historical sites in the country. For more information about visiting, check out our article on Fort Necessity National Battlefield. Dingmans Falls is one of the tallest waterfalls in PA and is located in the Delaware Water Gap National Recreation Area. The Delaware Water Gap National Recreation Area is the closest thing that Pennsylvania has to a true national park. However, while this free area might lack the prestige of being a national park, its beauty and recreational opportunities won’t disappoint. The Delaware Water Gap is home to some of the tallest waterfalls in Pennsylvania and some of the best vistas you’ll find in the region. The park stretches along the Delaware River and features outstanding scenery on both the Pennsylvania and New Jersey sides of the river. 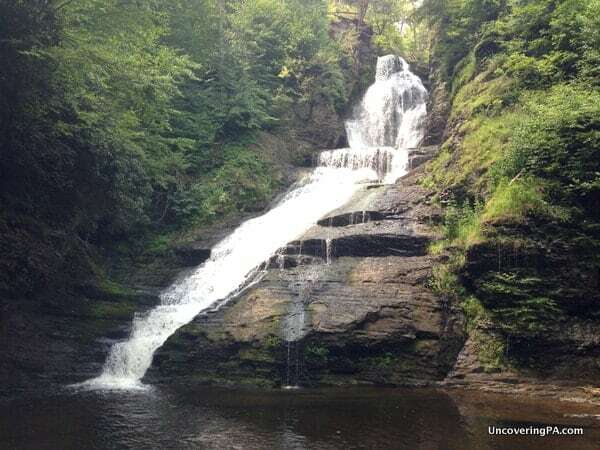 Highlights of the area include Raymondskill Falls, Dingmans Falls, George W. Childs Recreation Area, and Cliff Park. Valley Forge National Historical Park shows what life was like for soldiers in the Continental Army during the Revolutionary War. Valley Forge National Historical Park is the site of one of the Revolutionary War’s most well-known stories. During the winter of 1777-1778, the Continental Army, under the command of General George Washington, camped on this site. His troops suffered hardships, but ultimately left this camp as a fighting force capable of taking on the great British army. Visitors can drive around the site and learn about what life was like in the camp, and how the army’s experience led to their ultimate victory. Find out more about visiting in our full article on the park. The Allegheny Portage Railroad was an important step in the transportation history of the United States. Before the completion of the Allegheny Portage Railroad, it took weeks to travel from Philadelphia to Pittsburgh. However, once this system of canals and railroads was completed, the travel time was cut to just a few days. 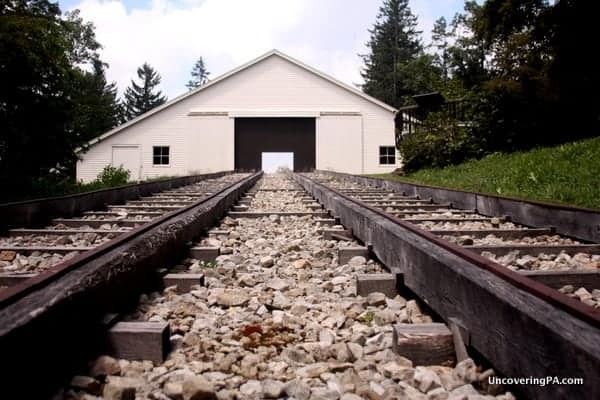 The Allegheny Portage Railroad National Historic Site tells the story of this important transportation system, and how it affected the movement of people and goods westward. 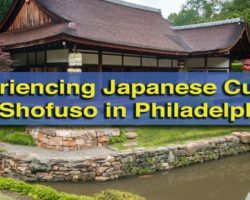 For more information about visiting, check out my article and video on the site. 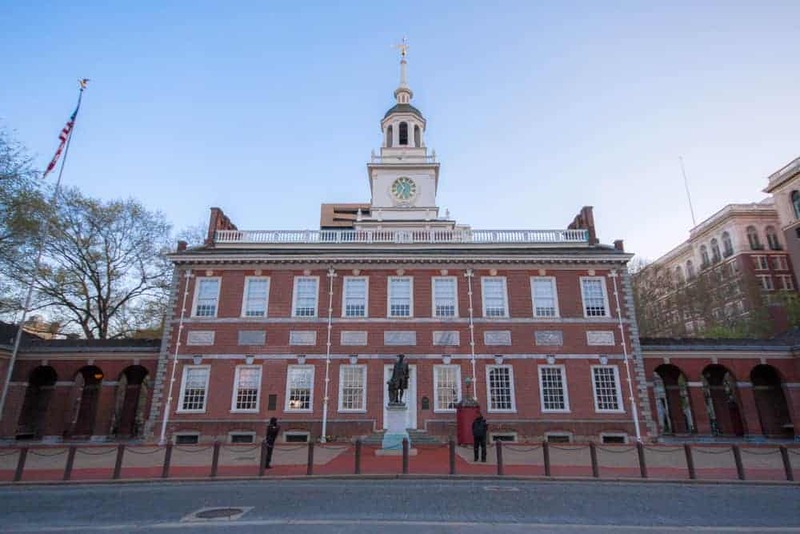 Independence National Historical Park in Philadelphia is home to the places that shaped early American politics. Few sites in the United States are as important as Independence National Historical Park, and the area has also been recognized as a UNESCO World Heritage Site. The park comprises nearly two dozen sites in downtown Philadelphia that are connected to the foundation and early political history of the United States. The most important site is Independence Hall, which was where the Declaration of Independence was debated and signed. For more information, check out our article about Independence National Historical Park. 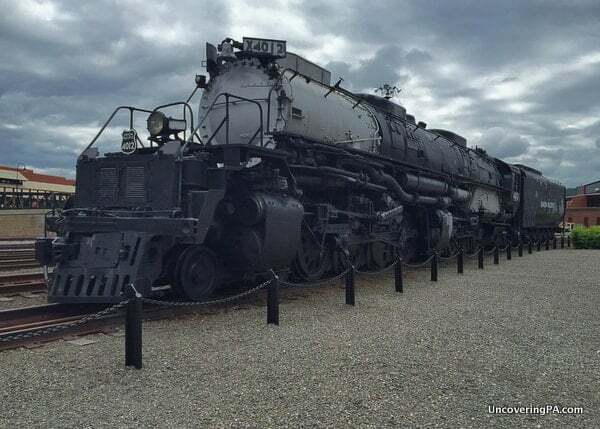 Steamtown National Historic Site is home to many rare train engines, including this Union Pacific Big Boy. If you love trains, you won’t want to miss Steamtown National Historic Site in Scranton. This site covers the history of train travel throughout the country, with an emphasis on the region. Visitors can see dozens of historic railroad engines and cars in various conditions. Displays also teach visitors about what life was like for those working on the railroad and riding the trains in the 19th and 20th centuries. Even better, Steamtown offers regularly scheduled excursion trains throughout the year. Find out more about visiting Steamtown National Historical Site in our full article on the site. The Flight 93 National Memorial is one of the most sobering places in Pennsylvania. 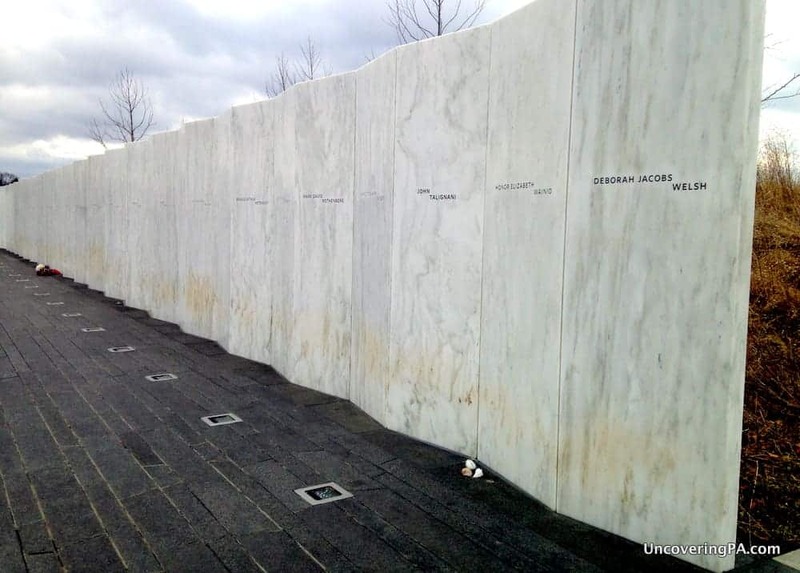 The Flight 93 National Memorial near Somerset, Pennsylvania, tells the story of United Airlines Flight 93, which crashed here on September 11, 2001. The site is set up as a memorial to the 40 victims who died after their airplane was hijacked. A new visitor center tells visitors their stories and the importance of their actions on the plane. For more information about visiting, check out our article on the memorial. Looking out over the Gettysburg National Military Park from the top of Little Round Top. 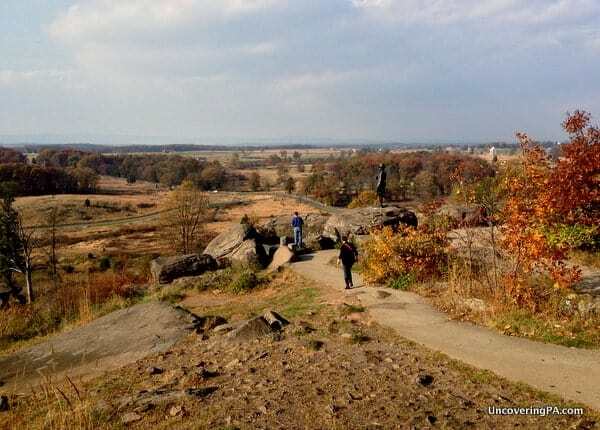 The site of the bloodiest battle of the Civil War, Gettysburg National Military Park tells the story of the nearly 200,000 soldiers that fought on this site on July 1-3, 1863. This decisive battle led to nearly 50,000 casualties and was the turning point of the Civil War for the Union forces. Visitors to the park can tour the grounds with or without a guide and see where the decisive moments of this battle occurred. For more information about visiting, check out our article on the battlefield and why you should hire a battlefield guide when visiting. 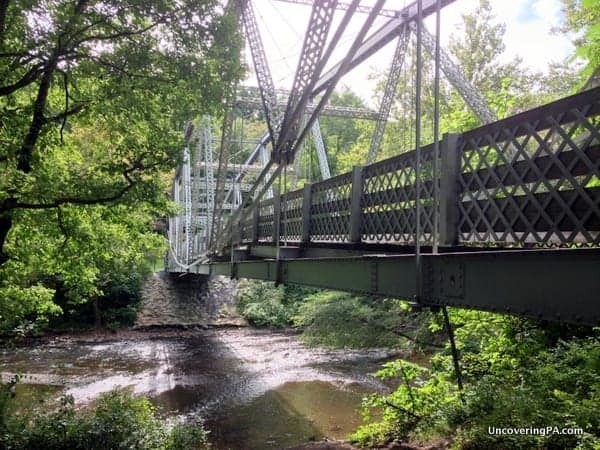 There are 230 miles of the Appalachian National Historic Trail in Pennsylvania, including this river crossing in Swatara State Park. The Appalachian National Scenic Trail runs 2,200 miles from Georgia to Maine, with 230 miles of that traversing Pennsylvania. 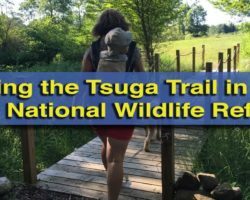 While some hike the entire length of the trail, many more hike shorter trips along the various portions of the trail. People looking for a great day hike can hop on at different points and hike as much or as little as they want. 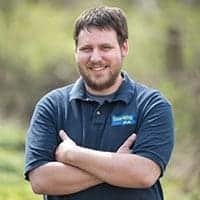 I personally enjoyed the hike to Hawk Rock Overlook near Duncannon, but there are many other great hikes along the Pennsylvania portion of this amazing trail. Hopewell Furnace National Historic Site in Berks County, PA.
Hopewell Furnace National Historic Site is a preserved 18th and 19th century iron furnace in Berks County. The furnace here made iron for weapons used during both the Revolutionary War and the Civil War. 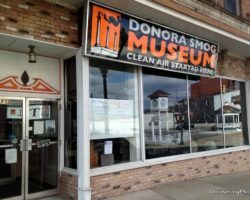 The site was also one of the first places in the United States to offer equal pay for equal work to African Americans and disallow any segregation in public life. In addition, it was also once a stop on the Underground Railroad. 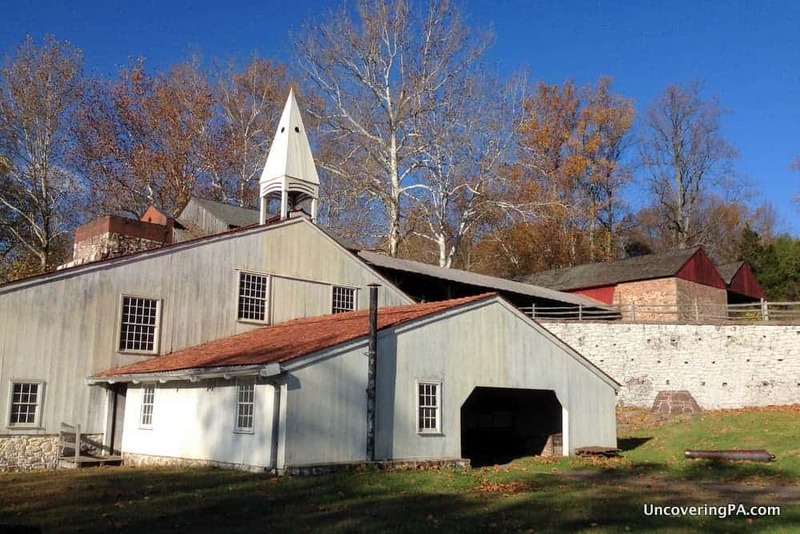 For more information about visiting this important site, read our article about visiting Hopewell Furnace National Historic Site.